Dromida is rapidly becoming a dominant force in radio control air and land vehicles, specializing in affordable products that anyone can have fun with. Don’t confuse affordable with cheaply made though, as their models are extremely well put together and are some of the best RTF’s you can buy for the price. 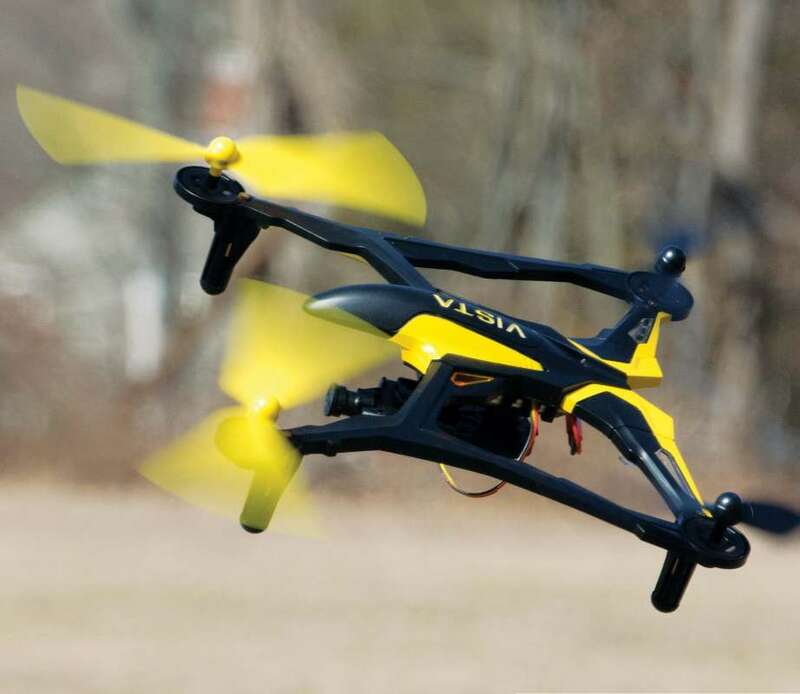 A while back, Dromida released the Vista UAV drone, which proved to be an extremely durable and great performing quadcopter that performed well indoors and out. While the UAV model still offers a great experience, it was just missing any FPV gear short of purchasing an external unit. 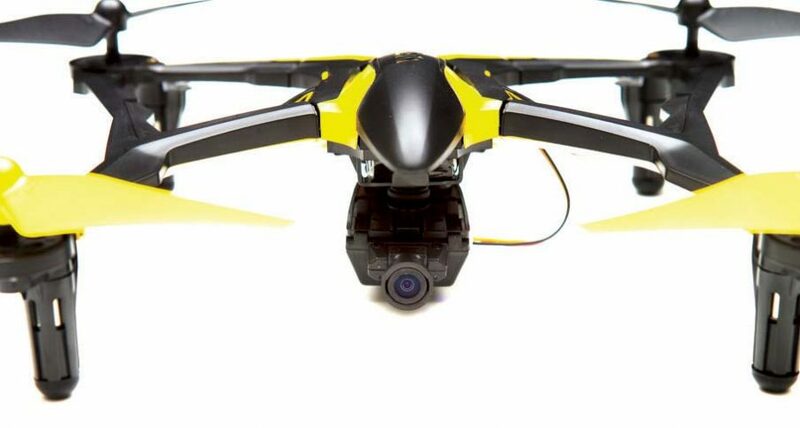 Dromida recognized the void and have released the Vista FPV, with an included WiFi digital camera and everything you need to experience FPV flight (except a smartphone or tablet for viewing purposes). • Absolutely everything is included to get you in the air and experiencing FPV flight including “AAA” batteries for the transmitter. • This RTF package includes a WiFi digital camera capable of taking HD quality videos and photos just by pressing a button on the transmitter. It also can be used in FPV if you link your smartphone to the camera using Hobbico’s free DroneView app. • The MR100 2.4GHz SLT Radio allows for easy access to multiple functions, such as auto flip mode and dual rates. It also has an integrated smartphone holder for FPV flight. • The 850mAh LiPo battery is charged with a small USB adapter that is easy to transport and ensures there always will be a place to power up. • The Vista FPV features a sleek durable design, outfitted with bright LEDs that indicate the battery status which can be viewed even in the bright sun. It also is a blast flying in a dark room which the lights can illuminate. • On-board electronics allow for an extremely stable experience via a “3+3” system, complete with accelerometers and a 3-axis gyro. The accelerometers can be turned off with the transmitter for more advanced users. I am still blown away with how affordable our hobby has become. The Dromida Vista is a glowing example of this, HD quality FPV flight for under 150 dollars is hard to ignore even for the most experienced of pilots. For those less experienced, the excellent instructions and various flight modes will help ease anyone into drone piloting, this would definitely make for a great first aircraft. Even though the transmitter had a unique design that I was not used to, I quickly became accustomed to it and appreciated how easy it is to access the various functions without affecting flight inputs. FPV flight worked flawlessly and the smartphone holder even could accommodate my giant Android device which made the experience all the better. Video quality was pretty darn good with the ISO anti-vibration mount producing better results than other similarly equipped models. The size allows for indoor and outdoor flight so I can definitely recommend the Dromida Vista to all drone pilots. Before I talk about the camera, it is worth giving a quick refresher course in the Vista’s features. You can tell the Vista was built with durability in mind, it reminds me of a tough toolbox that does not break. All of the lines on the frame give it this futuristic look and I would be surprised if anyone could ever damage the frame. 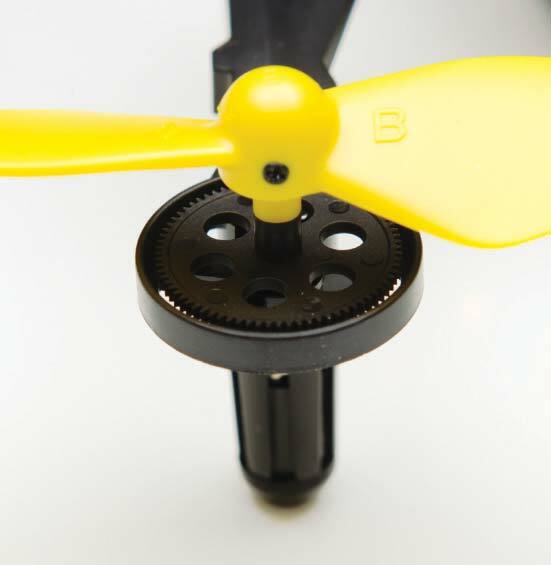 Adding to the ability of the Vista to take a hit there are motor guards and covers to the motor pinion and rotor gears, to protect the sensitive components. The most exposed part of the model then would be the propellers, but thankfully there is an extra set included in the kit. These are easily replaced using small Philips head screws. There are even rubber guards on the bottom of the drone to soak up any less than perfect landings. Being Ready-to-Fly model, all electronics are included along with the radio gear and main battery. The on board control system is a 3+3 unit, meaning it contains a 3 axis gyro and three accelerometers to help keep the vista in place. An 850mAh single cell LiPo battery powers the Vista and a USB charger is included within the box and will charge the battery up within an hour or so depending on the power source. 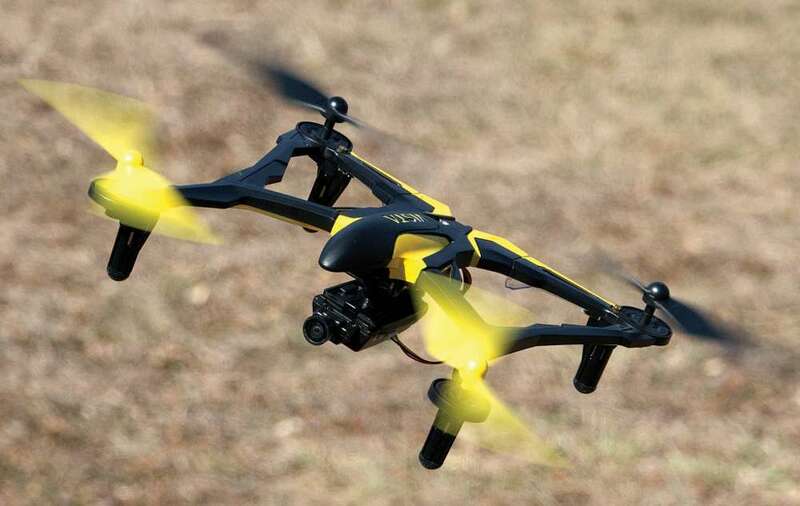 As for radio gear, this drone utilizes the MR100 2.4GHz SLT transmitter which has all of the features one would need. All trims are digitally controlled and there are easy access buttons for taking video, pictures, flips and flight mode (more on that later). While this does resemble more of a video game-like controller, I found it very comfortable and lightweight in my hands and I was able to access the various buttons on the fly better than a standard transmitter. A smartphone holder is integrated into the radio and it will accommodate even the more modern, larger sized phones with ease. That leaves the biggest addition to the version of the Vista, the included WiFi digital camera. The Tactic DroneView camera is available for purchase separately, but mates up perfectly to the Vista and looks like it belongs on the model. One great feature I noticed right away was the ISO anti-vibration camera mount which helps cut down those “jello” lines that some drones produce that do not have a similar system in place. I like to leave the camera off so I can get the maximum performance out of the drone unless I am going to shoot some video and I really appreciate that it only takes a few seconds to mount and remove the camera. With some other drones it is such a hassle that I end up leaving the camera on at all times even if I know I won’t be using it. The DroneView camera is capable of shooting videos in 720P resolution which I found looks great on almost anything other than the largest big screen TV’s. It also has the capability of shooting still images at 1 megapixel. Both functions are easily toggled with the transmitter or can be controlled by the DroneView app on your smartphone. To add to the great value of the model, a 4GB micro SD memory card is included which will hold well over 30 minutes of video, plenty for a bunch of flights. While I appreciate how easy it is to control the camera with the transmitter, running the DroneView app through my phone is the best experience in my opinion. Being a true FPV camera (WiFi), you will get a live feed of what the drone camera sees, which is important when trying to get that perfect shot or stunning video. The app also features an easy way to download your still images and video right to your smartphone by WiFi so you can quickly upload for friends to see. Alternatively, because the camera uses a standard micro SD card, any card reader will be able to view the files and the videos are in standard AVI type so any PC or Mac can edit the videos with ease. 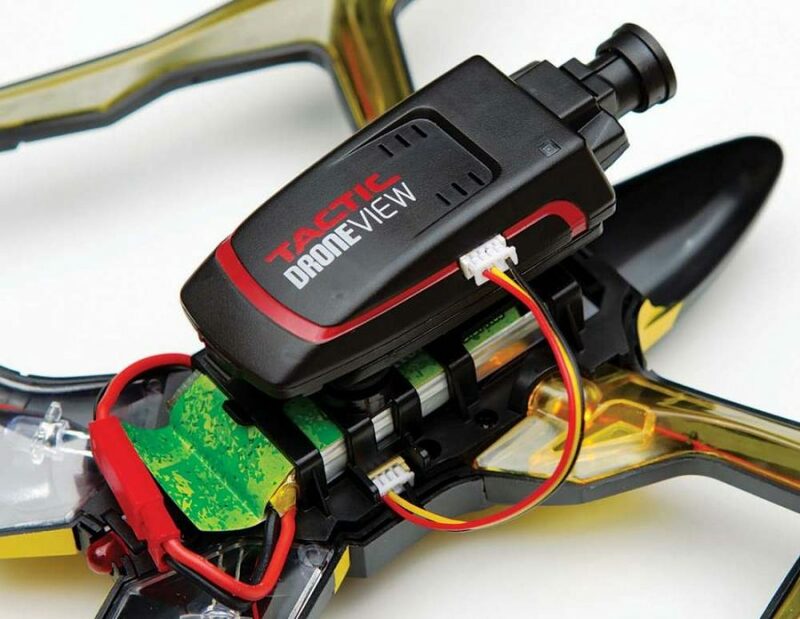 The Vista FPV is sold exclusively as an RTF drone and therefore minimal assembly is required. The first order of business was charging the main flight battery using the included equipment. The included battery is an 850mAh single cell LiPo with a USB adapter for charging. What is great about the USB charger over conventional wall chargers is there is always a USB slot around without having to find a free outlet for an AC adapter. Phone adapters, PC/video game systems and almost all newer TV’s all have USB connections that can be utilized. Dromida does sell an adapter which will give you the fastest possible charge time, but I had no problem using what I had around the house to charge the battery. no problem fitting my large phone, even with a case on, so most phones should fit in the holder. The WiFi camera is equally as easy to install, there is a shock absorbing mount that the WiFi camera plugs into and then it’s a simple matter of plugging in one cable, which the manual outlines the correct orientation completely. The included Tactic DroneView digital camera, is a WiFi enabled unit that can be controlled via your smartphone or tablet. One cool feature is it can link up to multiple devices so you can share the great views with other people. A definite plus was how easy it was to install and use the free app whether you run Android or IOS devices. Sometimes the applications that link up with similar devices are tough to use and quite temperamental (especially on Android devices), but thankfully the DroneView app was specifically designed by Great Planes and is very easy to use. On an Android system I simply ran the app and it automatically linked up with the WiFi camera and I saw a live feed right away on the screen. There is a slight bit of latency as this is a WiFi connection. There are a few basic controls within DroneView such as taking a picture or video, but I find just hitting the buttons on the transmitter to be easier and often the response is quicker. Using the live image to frame the shots and the transmitter to activate the camera seemed to be the winning ticket for me. I was eager to test out the FPV functionality of the Vista FPV, so my first few flights were with the camera attached and using the milder “easy” flight mode which softens the control inputs and helped me achieve a more steady flight. The camera linked up flawlessly and immediately I was able to see the view from the camera on my phone. The application worked great on my Android phone, the only issue was sometimes there would be some input lag when pressing the record button on my phone. After flying around inside for a while, I reviewed the video which I was able to transfer right to my phone. It looked absolutely fantastic, even with poor indoor lighting and it was relatively stable despite my inputs when coasting around the living room. I even viewed the video on my computer’s 23-inch screen which fully conveys the 720p HD video capabilities of the camera. I noticed that the photos I took inside were a little blurry, but any camera without a flash would have been, so make sure there is proper lighting when shooting photos (outside light is great). Yeah, the Dromida MR100 2.4GHz SLT radio is not a standard transmitter, but it felt very ergonomic in my hands and I quickly forgot I was holding anything. The only thing that took a few moments to get used to was the lack of a ratcheting throttle stick. What this transmitter design allows for is easy access to various buttons without having to look down and fumble with switches. I was snapping photos and starting and stopping videos on the fly, it was a seamless experience, just the way it was meant to be. I was even able to change the flight modes while the drone was in the air to test out the various levels of control the Vista offers. What I am getting at is don’t let the looks fool you, the transmitter has every bit of control as other RTR’s at a fraction of the weight. The camera is good and all, but a drone is nothing without its flight characteristics so how does the Vista fly? Fantastic is the only word that comes to mind. It was extremely stable for being a 250 class drone, something beginners and experts can both appreciate. I tested the bird outside on a moderately windy day and the Vista was able to battle the gusts, something other drones would struggle with. With the camera on still, I tested the flip feature and noticed that it was dropping quite a bit of altitude afterward, even full throttle could not prevent it from dropping. This had me thinking that the camera was impacting performance, so now that I was done testing the camera I wanted to see how the drone would fly with less added weight. With the camera off, I set the transmitter to “normal” mode which gives me full control inputs and still retains the gyro stabilization. Immediately I could tell the drone was more responsive and nimble, a combination of the different flight mode and camera being removed. Flips and rolls now did not chew up nearly as much altitude at all and I could perform one after another which was a total blast. I noticed that the Vista can bank at a very impressive angle which converts directly to speed and was quite surprised how fast I could get the drone going. With the stabilization on it would constantly fight the momentum, so once I turned that off I could get a real sense of how fast the drone was. The Vista totally gets going with the “expert” mode which removes the accelerometer stabilization. This is fun for some exhilarating fast flights, but after some testing I much prefer much more laid back flying with the stability on. With full controls if you pitch the Vista forward it will dive, so finding the perfect balance of lift and forward pitch takes some practice. The Vista is in fact as durable as it looks, I “tested” out this featured by running into a few household objects and not even a scratch was seen on the propellers. The Vista will automatically power down when it senses an object touching the propeller which helps save more critical components. With upwards of 12 minutes of flight time and a frame that is tough as nails, the Vista is the perfect first camera rig for blossoming pilots. Previous Liberty Cup Drone Racing: Next Stop … Nationals!